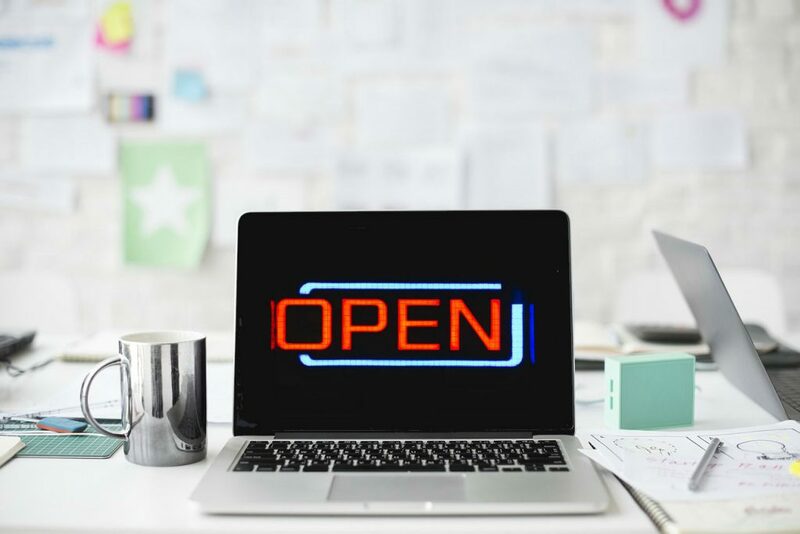 The University of Toronto continues to promote Open Educational Resources (OER) and Open UToronto is our initiative that promotes the discovery, use, creation and sharing of open content, resources and courses. We have produced dozens of Massive Open Online Courses (MOOCs), made available numerous open modules and published several open textbooks. Through eCampusOntario, we are now thrilled that two pioneering UofT instructors have been accepted as Open Education (OE) Fellows. A total of six new partners were recently welcomed, to lead action research focused on open education and contribute to the broader development of the open community in the province. The two fellows from UofT are William (Bill) Ju and Xinli Wang. William (Bill) Ju is an Associate Professor, Teaching stream in the Faculty of Arts and Science where he teaches courses in neuroscience and health/disease. He has a variety of different interests to improve student engagement in the learning process but is currently interested in social justice issues in STEM, educational equity, mental health in the classroom and, of course, how Open Educational resources can be used in all of these areas. You can often find him posting his thoughts, concerns and interests on Twitter using the ID @NeuroscienceUT. Xinli Wang teaches entry-level mathematics courses at University of Toronto, Mississauga, and Mathematics of Business and Finance at Seneca College. Her love of teaching started when she was a graduate student. After she received her Ph.D, She taught full-time as a math lecturer at Singapore Polytechnic for five years. Her current interests include flipped learning, blended learning, problem based learning, student engagement and open education resources. She does acrylic paintings to destress. She can be found at mathrojak.ca. 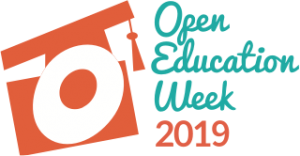 To celebrate Open Education Week 2019 the University of Toronto Libraries and Online Learning Strategies will host two separate events. In the first you will hear a range of perspectives on the opportunities and challenges in creating or adapting new open resources from those involved in projects funded by eCampusOntario. 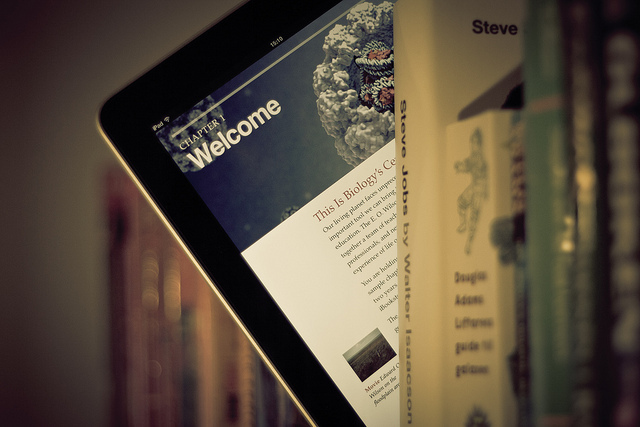 The second workshop will explore the Open Textbook creation platform Pressbooks. Faculty, undergraduate and graduate students, librarians, and staff from all three campuses at University of Toronto and beyond are welcome to attend. This event will showcase the findings of a recent University of Guelph study exploring the impact of cost and access to course materials on student success. In addition, University of Toronto instructors, librarians, staff and graduate students who have had first hand experience in the creation and adaptation of open textbooks will share their strategies and insights. 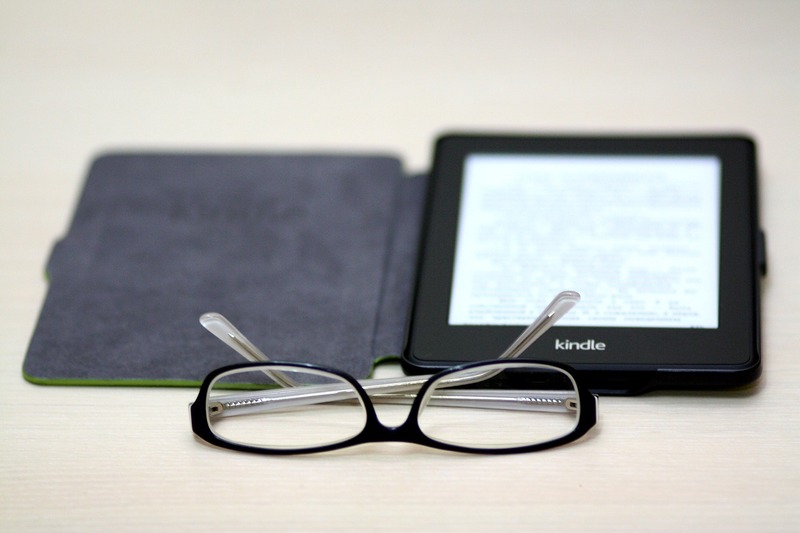 Interested in creating, adapting, discovering, or publishing an open textbook? Curious to learn strategies for the discovery and use open resources others have created? 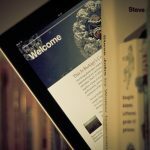 Pressbooks is an online book and document formatting system that you can use to create books that are accessible on all platforms: in print and digital, including all smartphones, tablets, e-reader devices, and computers. For programs offering online courses, access to tools and services that ensure academic integrity for students who are at a distance is a priority. Several divisions at UofT have successfully used video-based online proctoring of exams for a number of years, allowing for student convenience at a relatively low cost. Now, following an extensive review process involving consultation with our current users of online proctoring or “eproctoring” services, the university has identified two recommended vendors of these services and confirmed campus-wide pricing. 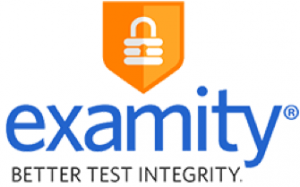 Each of these vendors has been thoroughly vetted to ensure that they meet our requirements for data security and privacy; reliability and accuracy; technical support services; and full feature platforms. While these providers provide a new option for online assessments, decisions regarding use of these tools and responsibility for follow up on any potential issues remains with our academic program areas. Interested in learning more about eProctoring options at UofT? Webinar events have been scheduled to allow each of these vendors to provide an overview and demonstration of their products and services. Register below to receive an invitation to attend. Full details on product features, implementation, rate sheets and more will be available soon. Contact online.learning@utoronto.ca for more information. Imagine students discovering concepts through exploration and honing skills through an immersive simulation experience. At the end of October faculty and staff gathered at the Centre for Teaching Support & Innovation to attend a full capacity event to share and explore these emerging trends. Developed by Diane Michaud and Laurie Harrison, this orientation workshop brought future looking instructors and educational technology support staff together to introduce the potential of AR (augmented reality) and VR (virtual reality) for teaching and learning. The session was co-facilitated by several pioneering faculty members who presented their creative examples of the use of these technologies at the University of Toronto and beyond. Anesthesiology Professor, Dr. Fahad Alam presented his research team’s preliminary findings after sending out stereoscopic viewers for their ChildLife app featuring 360 videos that aim to reduce pre-procedure anxiety in patients coming to the Hospital for Sick Children. Johanna Carroll and Martina Steiner, Teaching Stream Professors in Molecular Genetics discussed their project using immersive virtual reality-based wet labs for students to view and experience via some of the latest wireless VR headsets. The final faculty demo was from Professor Dawn Kilkenny of the Institute of Biomaterials and Biomedical Engineering who described her project of creating custom virtual labs. Participants were asked to consider how these technologies could serve their learning objectives for students or solve an instructional challenge. They were then able to discuss the applicability of extended reality technologies for specific course goals and explore related instructional design considerations. By the end of this session attendees were able to identify VR integration and development options, apply a practical framework for teaching and learning activity design ideas and begin to assess their own level of readiness for adoption of extended reality technology. 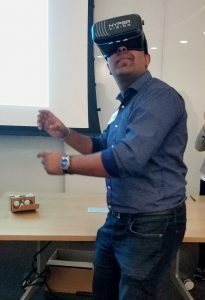 Dr. Chirag Variawa, Assistant Professor, Teaching Stream, Faculty of Applied Science and Engineering watching a 360 video on a mobile phone in a stereoscopic headset. As a bonus, participants who arrived early were treated to a demo of VR and AR equipment and content. There were AR triggers for the ARchemy app created by Shadi Dalili, UTSC Chemistry Professor and a team of talented developers. Participants were able to try out a few VR headsets ranging from stereoscopic viewers for smartphones such as Google cardboard and a comfier plastic headset. A few folks tried out the fully immersive Lenovo daydream headsets with controllers to explore Labster’s virtual science labs. Those who demo’ed equipment were curious and enthusiastic, a reflection of the growing interest in the engaging learning possibilities of AR and VR and there was certainly an inspired buzz at this full-to-capacity workshop. Hearing a lot of hype around experiential learning? Are you new to this idea, or have you been a long-time advocate and facilitator of experiential learning opportunities? If you fall into either of those categories, this blog post is for you. The University of Toronto is developing a suite of open-source, reusable modules to respond to a range of needs in this broad domain. Whether you currently facilitate or are in the planning stages of developing a curricular or co-curricular EL experience, these modules and the flexible learning assets within them can be tailored and integrated into your context. How did this project come about, and how can you get involved? Read more to find out. In 2017, the Ministry of Advanced Education and Skills Development (now the Ministry of Training, Colleges and Universities) offered funding through the “Career Ready Fund” to support the development and expansion of experiential learning (EL). Specifically, funds were made available to support coordination and streamlining of EL experiences, developing faculty resources to support EL integration, and improving access to EL opportunities for students. At the University of Toronto, a number divisions asked for a suite of online modules to support EL. Rather than having everyone create their own material, the University decided to establish a group to look at developing a suite of open educational resources that can be adopted or adapted across faculties and divisions. Which brings us to this project. These resources are being created specifically with re-use, adaptation, and customization in mind so they can to be integrated in multiple ways to support differing practices, goals, and outcomes including curricular and co-curricular needs. To date, a group of representatives, including both content and subject matter experts, from divisions across all three campuses have collaborated on the initial topics and outlines and will continue to provide input into the planning and development of the resources. With student-facing and instructor/staff-facing modules, topics include: student readiness quick start, personal learning plan, student roles & responsibilities, reflection, partnership stewardship, instructional practices, assessment and reflection design. What are re-usable modules? We are creating a group of learning assets—including powerpoint slides, videos, and learning activities—and suggesting the ways in which you can layer these assets into a cohesive module. Just want a video or a few slides? You will be able to take these individual assets and integrate them into your program. We are currently in the design phase and drawing upon a broader group of stakeholders and subject matter experts to both incorporate existing and develop new material to make up the content of the EL resources. We will be developing these resources until January 2019 with ongoing consultations and contributions. The final phase of the project is to support implementation over the months of January to April 2019. In this phase, we will be consulting with partners to discuss how these modules can be used in their context. If you are interested in furthering EL opportunities and wish to contribute to these resources feel free to get in touch with us. Email Kimberly Elias at kimberly.elias@utoronto.ca . Collaborators on this project include: Vice-Provost Innovations in Undergraduate Education; ITS – Online Learning Strategies; and Student Life. Recently we highlighted the use of the Riipen platform as an on-ramp to facilitating work integrated learning experiences. Riipen helps instructors set up micro-experiential projects with community organizations and businesses by finding matches and streamlining ongoing coordination and communication between the faculty, students and partners. This initiative is unique in its focus on integrating small projects into course contexts in alignment with learning outcomes. Shadi Dalili, Associate Professor, Teaching Stream is one of the instructors who pioneered the use of Riipen in her Winter 2018 course CHMD71 – Pharmaceutical Chemistry. Students in this 4th year course worked alongside research and development at pharmaceutical organizations to consult and create promotional materials. How did using Riipen help meet your teaching and learning goals? For my fourth year Pharmaceutical Chemistry course (CHMD71H), I had two major sets of learning goals: disciplinary knowledge learning goals (such as research, analytical, and critical thinking skills) as well as transferable, professional development learning goals (such as teamwork, time-management, multi-tasking, communication, delegation, and decision-making skills). Using Riipen helped meet most of these goals by providing a platform through which I could find an industry partner with whom my students could participate in a project in the field of pharmaceutical chemistry. This allowed them to gain firsthand knowledge on how to research information on molecular modelling and simulations used in the process of drug discovery and development, and then critically analyze this information to prepare a deliverable defined by the industry partner for a particular audience. This allowed them to practice critical analysis skills in appropriately using information for the intended purpose. Additionally, as they had to work in teams and deliver the project by a set timeline, they used a project charter based on the RACI (Responsibility, Accountability, Consultation, and Informed) matrix used in industry for team projects, to prioritize, delegate, and manage their time as a group. This was a valuable exercise in teaching them interpersonal and communication skills, as well as exposed them to a real-world scenario of how to work as a team and delegate responsibilities. With whom – community organizations, industry – did you partner? We worked with Cognigen Corporation, a SimulationsPlus company, that is based in Buffalo, NY. They were established in 1992, and have partnered with leading pharmaceutical and biotechnology companies, the World Health Organization, and the U.S. Food and Drug Administration, as well as provided pharmacology consulting and pharmacometric analyses for more than 100 drugs. They aim to advance the science and engineer the systems for model-based drug development, which is more efficient and cost effective in getting a drug to the approval stage at regulatory agencies compared to traditional methods of drug development. Why did you partner with them? We partnered with Cognigen Corporation as they had a wealth of experience in the field of molecular modelling and simulations in drug discovery and development, which is one of the topics of the course I wanted my students to get industry knowledge on. In addition, Cindy Walawnder, their VP of Operations who was the contact from the company on Riipen, was extremely helpful and communicative in defining a project for the students that was within their level of understanding and manageable in the period of the course. How did this experience meet (or not meet) your needs and expectations for your course goals? This was my first time using the Riipen platform, as was the case with the industry partner (Cognigen Corporation), and as a first time user, it exceeded my expectations of meeting the needs of our course. Many students commented that they thought the project was interesting and valuable, considering it allowed to work with a real company and familiarized them with the pharmaceutical industry. In addition, our students now each have a profile on the Riipen site, with ratings and comments from the industry partner in their portfolio, which I hope will help in their employability in the future. If you are interested in exploring the use of Riipen to support experiential learning experiences in your course there are new incentives to help the transition. The Ontario Ministry of Advanced Education and Skills Development (MAESD) awarded funding to Riipen as part of the province’s efforts to deliver Experiential Learning opportunities to every student in Ontario. With this funding, Riipen is able to subsidize a substantial portion of the cost of its platform to companies and organizations of all sizes interested in participating in real-world project initiatives at educational institutions across Ontario. The Fund will support eligible projects through to March 2019. More details can be found on the Riipen Career Ready Fund page. Lynda.com – For students – and for instructors too! Do your students need access to online resources to brush up on software or technical skills? How about coaching on communication and presentation skills? Or perhaps as an instructor you need a quick tutorial on creating course modules in Quercus – or using Office 365. From A to Z, Adobe to Zoom, you can find a treasure-trove of instructional videos and practice activities via the Lynda.com learning platform now available at U of T.
That’s right. Students, staff, and instructors have access to the full catalogue – all videos, assessments and activities – through a new provincial licence to Lynda.com. Using your UTORid to log in, you may choose from more than 1,400 online self-paced courses that cover a wide range of topics, including professional development, business, IT, software, and design. There are even playlists for teaching strategies! Use the resources to support personal learning and development or integrate relevant content as a supplement to course materials. Explore Lynda.com to find, curate and share content, whatever the learning need. Read the full details for Lynda.com access. Over the weekend of April 7th and 8th, Clyde Matava, Fahad Alam (members of U of T’s AR/VR Network and founders of CHISIL, Collaborative Human Immersive Interaction Lab) along with a small team of co-organizers held a wonderful conference on augmented, virtual and mixed realities in healthcare called Realities in Medicine. There was a striking variety of applications discussed such as therapeutic VR, as well mixed reality for patient education and practitioner training. This will serve as a recap of some of the highlights. The first day’s keynote was Dr. Walter Greenleaf, a neuroscientist and developer from Stanford University who shared examples of VR for treating PTSD and phobias such as a fear of heights. Amongst other things he talked about the Stanford Virtual Heart program designed by Stanford cardiologists and cardiothoracic surgery experts. This was followed by a panel on advances in extended realities technology in patient and medical education. Rounding out the morning was a pitch competition called the Sharks’ Den. It included wonderful pitches for applications such as virtual reality “last wish” experiences for patients in palliative care, a hands-free augmented reality app with virtual hands to guide the movements of clinicians as they learn surgical procedures, immersive videos to teach pediatric patients about their conditions and treatment and other great ideas. There were some brief oral presentations about completed or in-progress research projects such as augmented reality in ophthalmology training, using augmented reality on 3D printed anatomical models and textbooks for medical students. Other notable projects included a head-mounted holographic needle guidance system and immersive media to enhance empathy skills in medical training. Then there was a technical showcase, where Dr. Sonny Kohli discussed his suite of Cloud DX patient monitoring hardware and software options and even live-demonstrated their Vitaliti Cough Analysis App. Then, Dr. Osamah Choudry, Neurosurgeon and founder of MediVis described with video the holographic AR representation of CT scans that can be overlaid as a 3D image on top of a patient before and during surgery. Then David Parker talked about his non-profit Wishplay that uses immersive virtual reality to enable unattainable experiences for dying and disabled patients. Prof. Ben Lok of the University of Florida is well established in the field of creating of virtual patients. He discussed virtual physicians to answer post-surgery questions, virtual physician avatars for reaching rural populations, virtual mental health practitioners to mitigate the wait time for seeing an actual practitioner in person. He also discussed having students create the virtual patients and how this exercise really enhanced their empathy for patients. You can try for yourself interacting with their virtual patients created by their virtual experiences research group. The second day started with a keynote by Dr. Hunter Hoffman, a pioneer in therapeutic VR for pain distraction and Principle Investigator at the University of Washington’s Human Interface Technology Laboratory. He talked about his early work creating the seminal immersive SnowWorld game used during wound care for patients with burns. It was originally conceived for children but that in his experience, burn-afflicted adults enjoyed it as much as the younger patients and it seemed to be as effective in distracting them from the pain. Dr. Hunter Hoffman showing a still from a later version of SnowWorld, the first ever virtual world created for pain distraction. There was a panel on immersive reality in the clinical realm. Dr. Clyde Matava described the lessons learned through their implementation of pre-surgery exposure therapy immersive videos and discussed plans for future developments. The Manager of eLearning and Educational Technologies at Baycrest Health Sciences, Cindy Plunkett, described an AR app she designed to orient new staff to the hospital campus. Lisa Sokoloff, Manager of Training & Simulation described a project she is co-investigating of using VR dementia simulations to increase empathy. The technology demonstrations were fun too. Me trying out the Microsoft HoloLens (hands-free mixed reality). What you cannot see is that I am removing layers of muscle from a full size anatomical model. There was a helpful panel discussion on commercialization and funding opportunities for development of extended reality (virtual/augmented or mixed reality) applications and innovations. The conference concluded with a technology showcase featuring Robert Amyot, President of CAE Healthcare and Vimedix, Virtual Imaging Training Systems along with Michael Thibodeau of Microsoft. All in all, it was a very inspiring conference and the first of its kind in Canada. The medical and healthcare community has certainly recognized and seized upon the potential of extended reality technology for enhancing patient care, medical and patient education and clinical practice. Keep up the good work CHISIL! You may have heard the buzz around Integrated Learning Experiences (ILEs) in the last several months at the University of Toronto. Interest and engagement has been growing with news of institutional priorities related to the Integrated Learning Experience framework developed by the Provost’s Task force on Experiential and Work Integrated Learning and a range of initiatives aimed at increasing capacity in these areas. One new project to come out of this exploration is a pilot that supports the experiential learning across a range of discipline and course contexts, targeting opportunities for undergraduate students. Within a course context, they will work on mini-projects, or “micro-experiential learning” assignments that are aligned with course goals, as well as an external partner needs. The project leverages a third party platform, Riipen, to facilitate partnerships with community organizations and businesses by helping with the matching process, project set up, and ongoing coordination. Instructors who are experimenting with the Riipen platform are aiming to provide a wider range of experiential learning opportunities for undergraduate students, while at the same time streamlining the administrative workflow and coordination tasks. Another feature is the opportunity for students to get feedback directly from community partners and create a portfolio featuring their demonstrated skills. The initiative, lead by Prof. Phanikiran Radhakrishnan of UTSC, has been funded by the Learning and Education Advancement Fund (LEAF) as a two-year pilot. The aim is to evaluate Riipen’s potential to advance the goals described by of the Task Force on Experiential Learning. Across the institution we are seeking to provide students with the “ability to bridge theoretical and practical learning and to observe how the material they have learned in class takes shape in the world… and include(s) examples of experiential, work-integrated, and community-engaged learning that integrate disciplinary outcomes with community engagement and competency development.